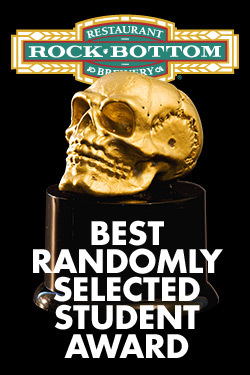 The iOWest Del Close Awards Committee is proud to announce that The Rock Bottom Brewery Best Randomly Selected Student Award will be awarded for the first time ever at this year’s iOWest Del Close Awards. Sponsored by the good people at Rock Bottom Brewery, The Rock Bottom Brewery Best Randomly Selected Student Award is open to any current iOWest Training Center student attending the 2008 iOWest Del Close Awards. Students may submit their names at the Box Office during the Red Carpet Pre-Show on Saturday, August 22nd starting at 8pm. The winner will be chosen at random live onstage during the Award Ceremony. The winning student will receive a Del Close Award statue and bragging rights. The 2008 iOWest Del Close Awards take place Saturday, August 22nd at 9pm at the iOWest in Hollywood, CA.